I'm super excited to share this look with y'all tonight on the blog. 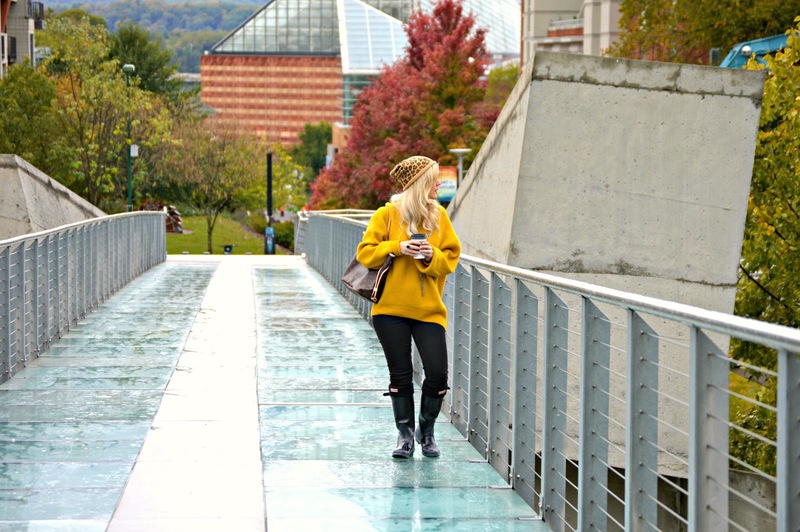 Last weekend it was a SUPER chilly, rainy, and dreary Saturday so I was ready to brighten it up by breaking out this beautiful mustard yellow chunky knit from H&M. If you follow me on Instagram HERE, you know that my local hometown of Chattanooga had its grand opening for a new H&M store yesterday. I arrived 2 hours before the opening and it was definitely a big party, there was a DJ and even cookie cake! Talk about fun! H&M is one of my all-time favorite go-to stores for budget friendly, yet on trend fashion. I actually bought the sweater in this #ootd from the H&M in Charleston, SC on our trip and it was $34.99. 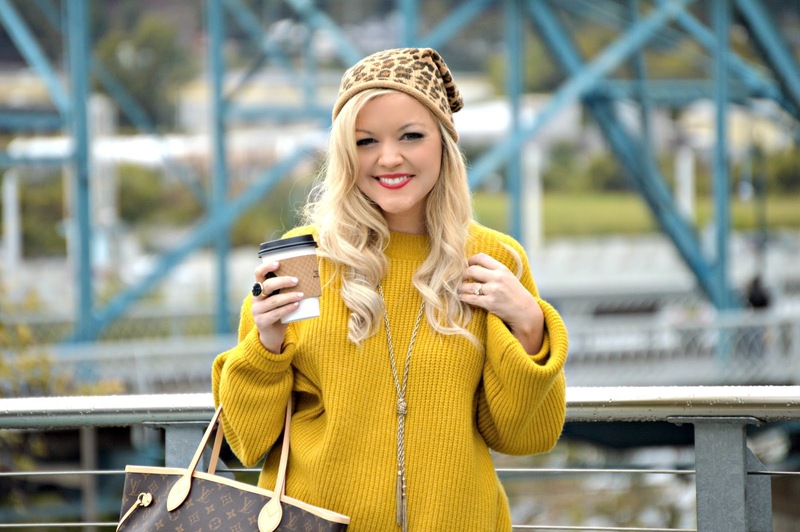 So I am in looooove with this sweater for many reasons....the first being the COLOR: mustard yellow is one of my faves for fall (as you can tell in this post here and here). I also love that it's a chunky knit so it's cozy and perfect for colder weather. Moreover - the length is PERFECT! It is long enough to cover your hips, and perfectly acceptable to wear with leggings. The ideal sweater, right!? 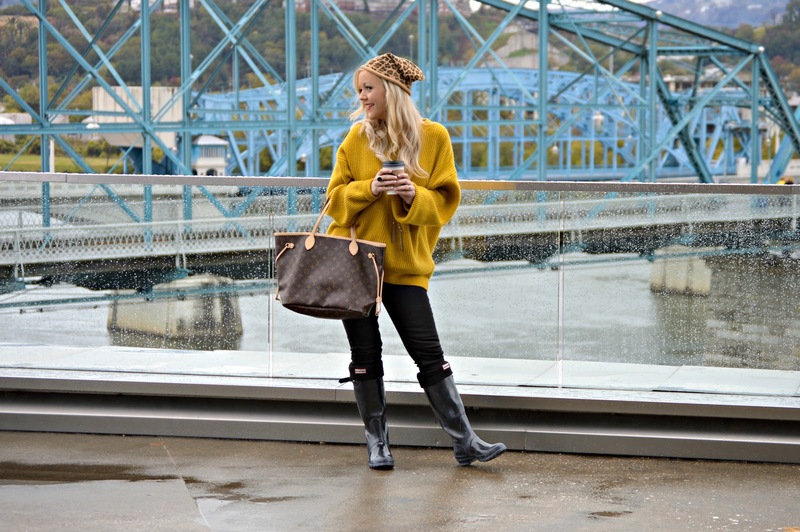 Since it was raining, I completed my rainy day style with 2 must-have accessories: a beanie and my favorite rain boots. This beanie was a hit last year and I'm happy to say it's back (and fully in stock!) again this season. A beanie is a must for a rainy day to hide any frizz that sometimes my hair likes to have in the rain, haha! 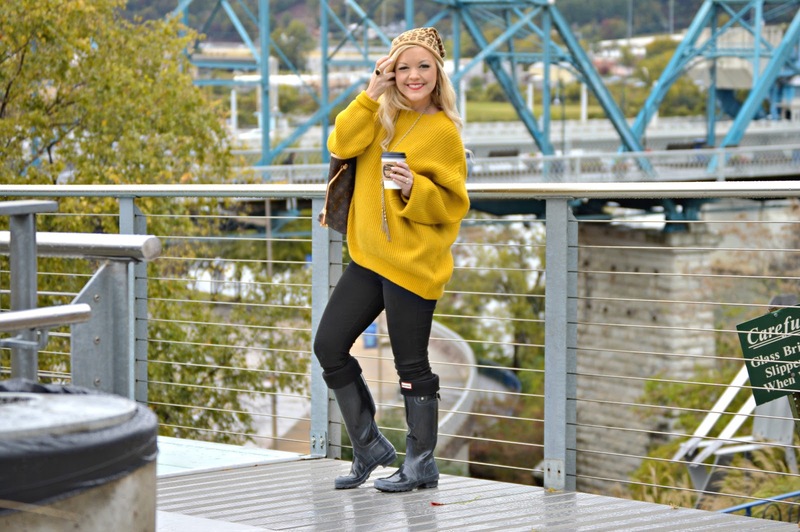 Also, a rainy day is the perfect excuse to wear one of my favorite pairs of Hunter rain boots. I also love the boot socks with them; they are fleece so they are extra toasty for a chilly fall day! Thank you SO much for stopping by and reading! I hope y'all have a FABULOUS weekend! !